One of the selling points made at the original Xbox One reveal was the massive (around $400 million over five years) deal struck between Microsoft and the NFL. Little was discussed outside of Surface tablets being used on the sidelines of games, advertising elsewhere in stadiums, and Fantasy Football integration to be available on the One and 360. Today further details were revealed on what to expect going forward. NFL Sunday Ticket won’t be available on any console this year so that isn’t in play here. The content being provided instead will come directly from the NFL Network and NFL RedZone feeds and NFL.com for scores, stats, and highlights. Of course, like the WatchESPN app, in order to access NFL Network and NFL RedZone subscriptions to them already through cable providers will be required. Xbox Live Gold is required to access any NFL or ESPN content. So at least initially the NFL deal really won’t mean much in selling the Xbox One even to sports fans. What is being offered is fairly inconsequential – NFL Network and RedZone must be had already in order to watch them through the console. NFL.com Fantasy is far behind Yahoo and ESPN in users, seasons will be nearing the playoffs by the time the console releases, and people are completely comfortable using phones, tablets, and PCs for everything fantasy related. The fantasy app is available now on the Xbox 360, Windows 8, and Windows Phone 8. The NFL on Xbox One. Only Xbox One delivers the best of the NFL personalized for you, in a way that will completely reimagine your football experience. It will bring live games and your fantasy team together on the best screen in the house – your TV. ♦A personalized destination. Tailor your experience for your team from the best content the NFL has to offer, including NFL.com, NFL Network and NFL RedZone. ♦NFL.com Fantasy Football. Xbox is the best place to track your NFL.com Fantasy Football team, and Xbox One delivers an integrated experience so you are up to date on all the analysis, highlights, news, stats, scores and standings. ♦A new way to experience live TV. Xbox One reimagines the way you experience live TV. With the Snap feature, you can watch live games and track your fantasy team, or the latest scores and stats, at the same time. ♦Connected. Sports are best when fan-to-fan heckling can commence. The NFL on Xbox One will connect fans through Skype, curated Twitter feeds and NFL.com Fantasy Football, ensuring that no win or loss is left unmentioned. ESPN on Xbox One. ESPN on Xbox One curates the best ESPN content just for you. ♦Favorites. Deeper personalization with your ESPN.com account means you can customize your ESPN experience to the teams and sports you care about most. ♦Scores. Personalized scores and stats work with Snap or full-screen mode. NFL.com Fantasy Football on Xbox 360. When the NFL season kicks off on Sept. 5, Xbox 360 will be there to offer a new way to track your NFL.com Fantasy Football team and league – on your TV. A destination awaits that is easy to access, is personalized with the fantasy scores and updates you need, and brings the best of the NFL’s fantasy analysis and highlights right to the best screen in your house. ♦Your fantasy highlights. We know your NFL.com Fantasy Football team is serious business, and to perform your best the analysis and news has to be intuitive and easy to find. 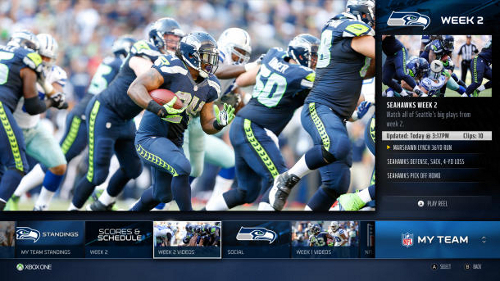 Xbox 360 brings together the highlights and analysis for your NFL.com Fantasy Football team into one, easy-to-access place – your TV – to make sure that you don’t miss a thing. ♦Fantasy league tracking. The Xbox 360 app provides real-time fantasy stats, scores, matchup updates and league standings for up to six of your NFL.com fantasy leagues.